Really, who doesn't dig dinosaurs? Lumbering, sprinting or flying about our planet roughly 230 million years ago, they came in a surprisingly wide range of styles, in sizes XS to XXXXL. 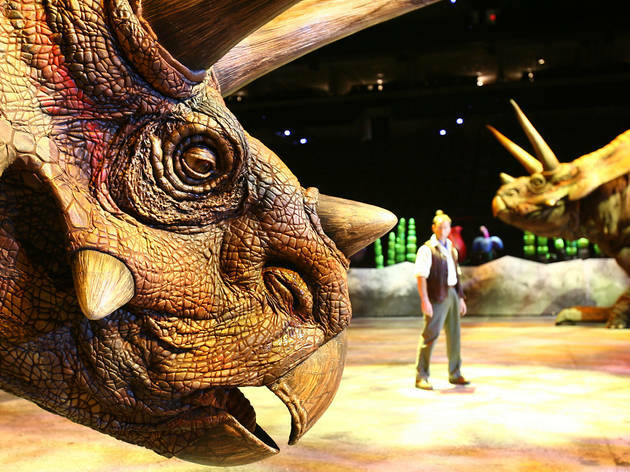 Their prehistoric ferocity and often mind-boggling mass makes them seem as mythical to us now as dragons, and it's that thrilling improbability that the creators of this arena show have capitalised on. A theatrical spin-off from the BBC documentary series of the same name, 'Walking With Dinosaurs' is an Australian production that first toured the UK in 2009, but has since tweaked its content and shuffled its beastly cast. It's part educational programme, part wow-factor spectacular, and is pitched very much at families, sensibly running as two 45 minute acts with a half-hour interval. 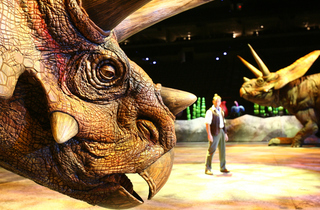 An Indiana Jones-styled character named Huxley is the onstage narrator, describing changes from the Triassic to the Cretaceous period, introducing the different dinosaurs as they appear and variously whipping up the tension of lightning storms and darting out of the way during battle scenes. Three large video screens provide the broader environmental backdrop. Evolution is the show's narrative arc, the animatronic creatures themselves create the drama. 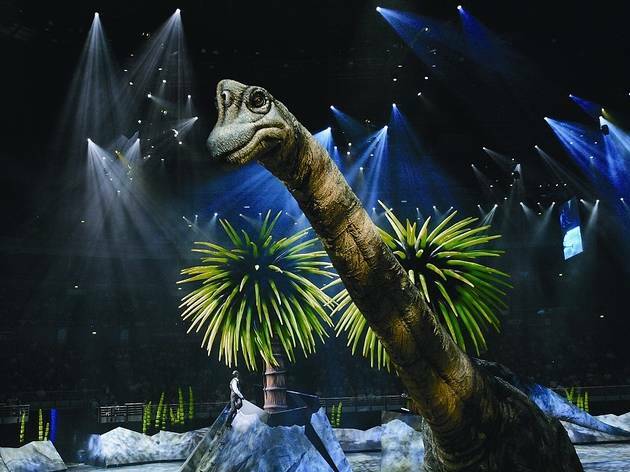 Describing the long-necked Brachiosaurus – whose disconcertingly ET-like head grazes the lighting rig – as lifelike is odd (who knows for certain exactly what they looked like or how they moved? ), but someone's done their paleontological homework, so yes, they seem very real indeed. It's a testament to both the engineers and the remote puppet masters that even though the tights-clad legs of the bloke inside the 30lb raptor suit are visible, and the other beasts clearly move by means of coffin-like 'cars', the spell remains unbroken. 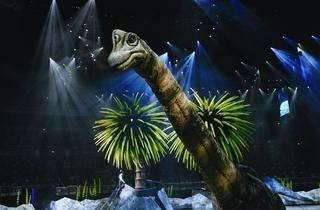 When T Rex – the big gun of the dinosaur world – emerges towards the end of the show, it isn't only the kids that gasp.